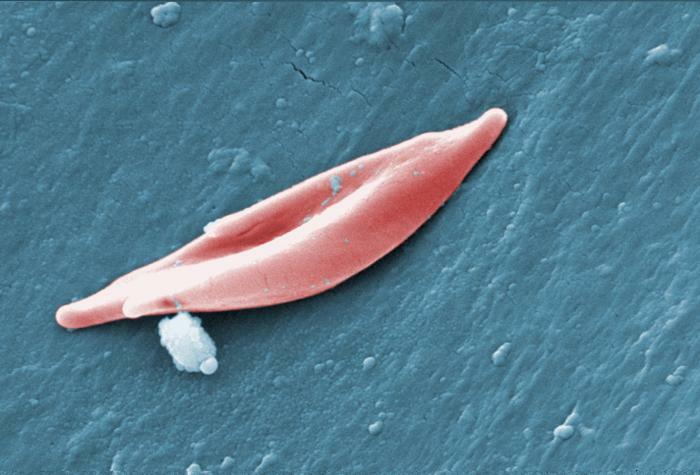 This digitally colorized scanning electron microscopic (SEM) image revealed some of the ultrastructural morphology of a sickle cell red blood cell (RBC) found in a blood specimen of an 18-year-old female patient with sickle cell anemia, (HbSS). People who have this form of sickle cell disease, inherit two sickle cell genes (S), one from each parent. HbSS is usually the most severe form of the disease. Sickle cell disease encompasses a group of inherited RBC disorders. Healthy RBCs are round, and they move through small blood vessels to carry oxygen to all parts of the body. In sickle cell disease, the red blood cells become hard, and sticky, and look like a C-shaped farm tool called a sickle. The sickle cells die early, which causes a constant shortage of RBCs. Also, when they travel through small blood vessels, they get stuck and clog the blood flow. This can cause pain and other serious problems. Links: Sickle Cell Foundation of Georgia, Inc.